Note: Read Mrs Whitlam before beginning to work with students and select teaching and learning activities that are suitable for your class, keeping in mind that this story involves the death of a child and racism. Before beginning this unit do an acknowledgement of country and briefly discuss the purpose. Introduce the book to students by showing the cover, title and author. Read the book notes from the Magabala website – here we are told that this book was shortlisted for 2017 CBCA Book of the Year Awards (Younger Readers category). Both these pieces have been written to entice the reader. After a chat in pairs or small groups, ask students to decide if one of these texts is more persuasive than the other and why. Then, back in pairs, ask students to make some predictions about the book. Record these to display and return to later in the unit or video narrate the predictions and upload onto the class blog site. Read Chapter 1 of Mrs Whitlam to the whole class. This short chapter introduces the reader to some of the main characters and the themes in this book. After reading, do a think-pair-share before having a brief discussion as a class. Then, working in groups, ask students to write down what they found out about the characters Marnie, Mrs Arnold and Mr Marriner from this chapter. The chapter is short so instead of descriptions, students will be looking for key words and inferences. For example on page 7 Marnie replies that ‘Mr Marriner said I could keep it with his – if I got one.’ The students might infer from this offer that Mr Marriner is kind. Students can record their responses in a grid. Once complete add a fourth column to describe social interactions. Ask students to look at the three characters and search for the way they interacted, for example, page 7 where Marnie shrugged her shoulders. Conclude by asking students what they are left wondering about. Record responses or video and place on class blog site, to return to after reading the book. Before continuing, ask students to find out about the author Bruce Pascoe. Bruce Pascoe is a Bunurong man born in Melbourne. Use an interactive map to confirm where he is from. Find out about the Bunurong people. Remind students that he has written several books including Fog A Dox which won the Prime Minister’s Literary Award for Young Adult Fiction. The book is suitable for students in years 4–6 so some may have read it. Bruce Pascoe also wrote Sea Horse. Record any observations students can make about this author’s style. If students are unfamiliar with Pascoe’s writing and unable to do this, suggest they look out for the descriptive language as they read. Students might observe the text is written in first person and think about how this works to engage the reader. Some teaching and learning experiences will be provided later in the unit to explore this further. Return to the title Mrs Whitlam. Read the dedication, ‘For Marnie. Mrs Whitlam (the horse and the woman), Gillian Mears, Rachel Womanbird and Quinn’. Ensure students notice the words in brackets. The title is an unusual one but the name Whitlam may be familiar to some students. If not explain that Margaret Whitlam was the wife of Prime Minister of Australia Gough Whitlam. Margaret Whitlam was a prominent Australian in her own right and died in 2012. Her obituary tells about why she was admired by many Australians. Some of these words might help students understand why Mrs Whitlam might be a good name for the horse they are soon to read about. ‘What Margaret Whitlam did, she did with her whole heart, with courage, with enthusiasm, without complaint and without hesitation…’. Ask students to do a quick write about what qualities the horse Mrs Whitlam may have, given her namesake. Return to these predictions later. Conclude by asking students why they think Bruce Pascoe chose to bring the Whitlam name into this text. Read chapter 1 again and ask each student to write about the character they are most interested to read more about. They might think about how the character is similar or different to one they have read about in another text. Ask students to think about the character traits inferred and the likely actions that might come from those character traits. The task will be assessed by the connections made by the student to what has been read and discussed so far and the structure of the student’s writing. The writing should be shared in groups of students who focused on the same character. Encourage group members to discuss the differences. Read the text to the whole class over a couple of sessions allowing opportunities for quick chats and reflection. To prepare for activities, students might record ideas or wonderings in student notebooks or on digital devices as you read. If books are available students can read Mrs Whitlam independently but this is an excellent text for reading aloud. After reading, arrange small groups and ask students to think back over the book and discuss aspects of Marnie’s character. What did you think when you first heard/read that? Perhaps Marnie is ashamed of her family? Is there any evidence elsewhere in the text that Marnie’s family might be different? What do you think now you have heard the whole text? What might you infer about Marnie’s character? Caution students’ to gather sufficient evidence before making any conclusions. Have one member of the group write down a character attribute contributed and justified by each group member. Discuss the concept of a character attribute first. Students can be guided to understand this refers to a particular characteristic of a person. Common qualities that might be identified include loyalty, kindness, honesty, etc. The group leader reads the comments back to the group and finally asks: Why did Mrs Arnold choose to give the horse to Marnie in preference to anyone else? The text ends with a short paragraph describing Marnie’s Mum crying having opened a parcel left by Mrs Arnold. Bruce Pascoe concludes the paragraph and the book with three single words. Was this a good ending for the book? Why? Why not? How did you feel at the end of the book? Could a different ending have changed that feeling? Discuss the non-standard punctuation used. Working in groups ask students to create character profiles on Prezi (or something similar) using the text to demonstrate what influenced the decisions made by the group. Choose one group to focus on the horse Mrs Whitlam. Suggest they find out a little about Clydesdale horses before beginning to identify Mrs Whitlam’s character traits. This is an unusual breed for riding and jumping so to understand the character of the horse, Mrs Whitlam, it is important this group finds out, and later shares a little more, about the horse breed. Invite groups to share their findings. Then with students back in groups ask them to identify if the character they chose experienced or demonstrated teasing, racism or prejudice at any time throughout the text. Share findings and use the book to unpack when these things were evident and each character’s response. Begin with the quote below. And Stevenson was with them. He always made a comment about the colour of my skin or my family. Ask the groups: what did you think when you read this? Ask groups to discuss this statement from Marnie’s father. It would be disrespectful to refer to an Aboriginal person as a ‘blackfella’ and here Dad refers to himself this way. Discuss. 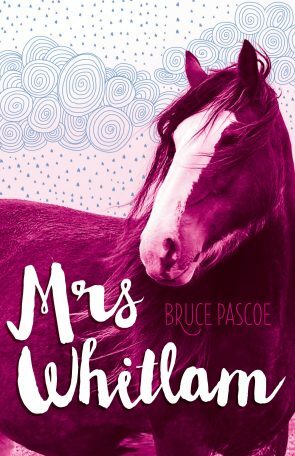 Return to the earlier discussion about why the horse was called Mrs Whitlam. Ask: have you changed your opinion now you have read the book? Did you find out any more as to why this is a good name for this horse? Conclude by making sure students understand that ‘old man’ refers to Mrs Whitlam’s husband. Gough Whitlam was often referred to as the first Minister for Indigenous Affairs in the Australian Government. Some students may be interested to read more about this time. Students should independently read chapter 5 where Marnie returns home and her parents find out she has been given a horse. Ask students to think about the response from each parent. Do you agree with the advice from one or both of the parents. If so why? Would your parents have given different advice? Ask students to individually create a Venn diagram showing the response from Marnie’s parents on one side, the response they would expect from their own parents on the other and advice that most likely would be similar in the intersection of the circles. Conclude by inviting each student to share the Venn diagram in a small group. Ask each student to explain the decisions that were made. Mrs Whitlam is a narrative organised into sixteen short chapters that help the reader move through the text. Most (not all) chapters begin on the right-hand page with a grey and white image on the left-hand page. The image does not change the twelve times it appears. The image first appears in the background of the cover illustration. What is the impact of this image on the reader? Note the use of vertical lines in the images between chapters. What might these represent? Why has the author chosen to repeat it twelve times throughout the text? Why are some chapters without the visual chapter break? Here Marnie recognised her Uncle Binny’s voice. As a whole class talk about how they responded to the description. What does it make you think Uncle Binny’s voice was like? How else might it have been described? What is the impact of such beautifully crafted language? Now invite students to find and record other examples where Bruce Pascoe has used figurative language. Invite each group to discuss the examples found and to try and craft an alternative way to describe the thing, person, place or feeling. Page 32 ‘…but I couldn’t find anything to say that he’d believe, so I sat down with a plop on the boot rail with the wind knocked right out of me.’ I sat down heavily feeling totally deflated. Page 63 ‘The water bucketed along…’ The water was strong and fast. Invite each group to share at least one example with the class and share the pros and cons of the alternative description agreed upon. Return to the text predictions made at the beginning of the unit. Ask students to record any thoughts they have now, thinking about what surprised them after listening to and reading the whole book. Ask students to focus on any events that occurred that would have been impossible to predict and therefore a total surprise. Ask students to note anything they are still wondering about. After reflecting on these things, the task is to write a new blurb for this book. The task will be assessed by how well the student demonstrates an understanding of the purpose of a blurb and how well the new blurb reflects a deep understanding of the complexities of the book. Invite your students to think of their own stories connected to Marnie’s statement on page 21 when she said, ‘Luck, I had it all. No one had any idea how good my life was at this moment’. Ask your students to use Inspiration or a similar tool where they can map out their own story of a time when they felt their life was the best it could possibly be and perhaps they felt ‘full of themselves’. Once complete invite students to share their visual mapping in small groups before coming back to the whole class to discuss the process of creating a personal story visually. Chapter 12 describes the rescue by Marnie and Mrs Whitlam. As a class, map out the ‘episodes’ of the rescue beginning with Marnie hearing the screams, Marnie plunging into the water, Marnie grabbing the baby, etc. Bruce Pascoe carefully builds tension through a quick series of events that immediately engage the reader. Students will be able to identify several ‘heroes’ in the rescue, concluding with George Costa arriving and performing CPR which probably saved the baby’s life. George knew how to administer CPR as he had learnt it through life saving. Discuss the events of the rescue and the role played by Marnie, Mrs Whitlam and George and the other surfers. Invite students to research Hands-Only CPR (cardiopulmonary resuscitation) which is recommended for children. Discuss what students know about the features of procedural text and the placement of visual images. Invite students to work in groups to collaboratively write a procedure for this life-saving technique. Group members can take their own photos for placement in the collaborative text, considering the design features of information photos. Students should keep in mind their intended audience: other class members. Discuss what Marnie means by the term ‘honour’. By now your students will have opinions on how Marnie was able to do that. Brainstorm ideas as a whole class which may include things like her genuine gratitude, love for Mrs Whitlam and a series of unexpected events. Then, working individually, ask students to think about other ways Marnie might have thanked Mrs Arnold appropriately while honouring her daughter. Remind students that Mrs Arnold asked Marnie not to make contact with her. Ask students to begin by creating a concept map to link big ideas to subordinate ideas using verbs. Then using these ideas present the thinking to a small group and compare and contrast the thinking. Conclude by asking students to list the verbs they have used and to classify the verbs as doing, thinking, saying and relating verbs. Understanding these functions of verbs will help in the understanding of the role of verbs in developing characters. WENDY BEAN was a teacher in NSW public schools and is now an education consultant working nationally and internationally. She regularly works in schools with the aim of supporting positive changes in student outcomes. She has had a long association with the University of Wollongong, has worked on many national government projects including National Literacy and Numeracy Week and has designed and implemented a range of professional development courses for systems and schools. She is a member of ALEA and and is currently the Conference Liaison Director on National Council as well as having an active role on the ALEA Sydney North local council.